I've been thinking........ if this blog is about my creative journey then I need to stay true to my intentions. I realize that I have not been posting as often I could have been. I, have always and still do, struggle with being judged. My childhood was tainted with not being good enough. I know there are many other women out there who have the same fear. It's one that can be overcome, each time it presents itself, with action. I have decided to step forward with courage in my heart. It's about my creative journey, good and not so good. I hope it will encourage you to step out, too. I'll be your cheerleader. My word for 2013 is cultivate which means to apply oneself to improving or developing. One of the places I can cultivate is right here on this blog of mine. These are some of the art that I have been creating in my journals. I was thinking of my sister, Bonnie, who loves butterflies. My sister Bonnie has a severe case of viral meningitis. She went into the hospital on 12/8/12 and didn't leave until 1/18/13. I was feeling a little down about her and her situation when I did these pages in my journal. Once I allowed myself to feel my feelings I decided to paint my way out of the doom and gloom. They say art heals, well I believe it does, too! Needless to say, creatively I have been feeling like I'm in the ebb, again. I know it's natural to go there but it doesn't make it anymore comfortable. On Wednesday, 1/16/13, I went to take care of my sister. She was being released from the hospital and I wanted to be there to help with her recovery. After a few days, she encouraged me to paint something for her. Which I did by standing at her kitchen counter and talking with her. These are the paintings I created. Both of them were done with water color. A medium I had little experience with. Words are needed to complete them. So maybe I'll show them again later when they are done. Here's the greatest piece of all. One night I coaxed Bonnie into creating a piece of art. At first she was hesitant because she is not able to control her dominant hand. So this background was created by her painting with her left hand. It is truly a masterpiece! "to apply oneself to improving or developing"
Last year I was introduced to the idea of choosing a word and applying it to the year, using the word to motivate and guide me through out the year. In 2012 my word was New Beginnings click here to read more I had many new beginnings. 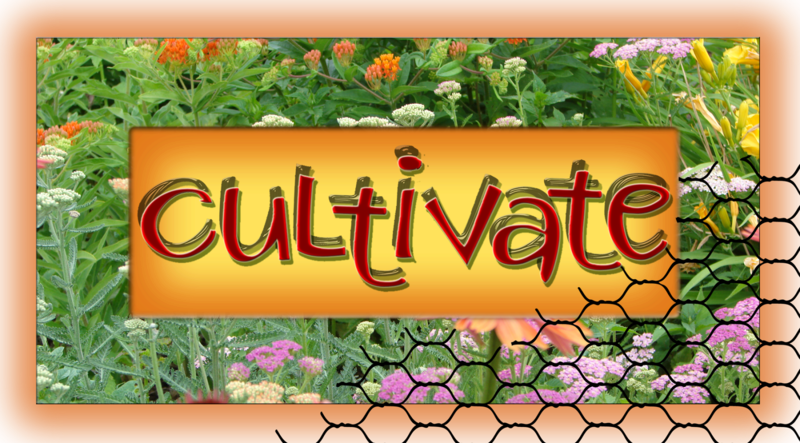 This year my word is cultivate. You may associate the word with farming and agriculture and that's OK. My creative journey, as well as my life, and farming have a lot a similarities. The definition I am referring to is "to apply oneself to improving and developing". All the seeds I planted, all the new beginnings I have started, I am ready to tend to them and develop them. It feels calmly exciting! I belong with a group of artist and we are all sharing each other's 2013 word as just another way to encourage each other. If you want to read more words just click on this link. Did you choose a word for 2013? Tell me if you did and what your word means to you, I really want to hear.